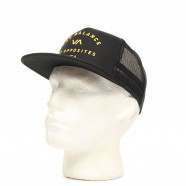 RVCA Caps - RVCA Tiki Trucker Cap - Black/green :: Men > Hats and Caps. Front RVCA brandingMen's capMATERIAL: 75% nylon. 25% polyesterArtwork by BJ PennAdjustable with snapback featureMesh backing Size: one size.